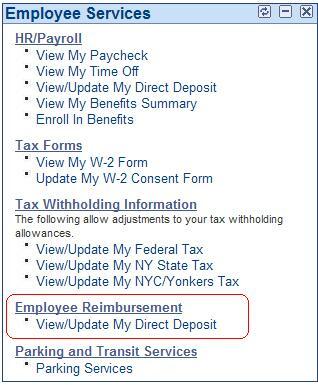 Direct deposit is now available to employees for non-payroll payments issued by the Disbursements Processing Office. These payments, previously only payable via check, are effective for items such as travel and other employee expense reimbursements. 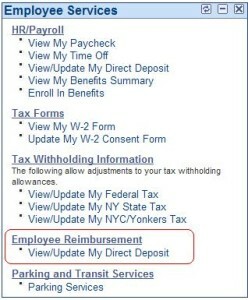 There is no change to the paperwork required to substantiate expenses; however, after signing up for this direct deposit option and submitting documentation for expenses incurred, you will receive an email notification when the deposit has been made to your bank or financial institution account. To participate in the Disbursements Processing Direct Deposit program, log on to MYSLICE and under Employee Services select Employee Reimbursement. Direct deposit saves time and money for all, and also helps the environment. Please become an active participant in the University’s Commitment to Sustainability.